Spring came early this year in the UK. We just experienced our hottest February day on record. While many were drinking beers outside celebrating this spectre of summer, others looked on with growing anxiety. Climate breakdown is revealing itself in a number of unprecedented events around the world, from forest fires in California, to the first ever snow in Hawaii. We are being told again and again by the massed ranks of the world’s scientists, armed with evidence of the most studied phenomena in human history, that life on earth is going to be destroyed if action is not taken. Yet again and again, nothing happens. There’s no reason expect that those in power will fix this problem. We need to rebel. There is something that hasn’t been tried in this country for the last forty years: mass participation in non-violent civil disobedience. Let’s celebrate coming together, get trained, organise – and have a damn good time doing it. Over a dozen musical acts have so far been confirmed including Sam Lee, Dizraeli, Mesadorm, Bellatrix, and more, alongside poets including Salena Godden, Vanessa Kisuule and Kev the Poet. Speakers include Mike Bonanno of The Yes Men, co-founder of Extinction Rebellion Dr Gail Bradbrook, author and founding member of Ecological Land Co-op Alex Lawry, writer for New Internationalist & Occupy activist Jamie Kelsey-Fry, and writer & artist Zoe Young. Let’s get trained for a rebellion. Then together we will do what all people do when enough is enough. We will go to the capital city, we will close down the city and we will stay there until this horror show is called off. 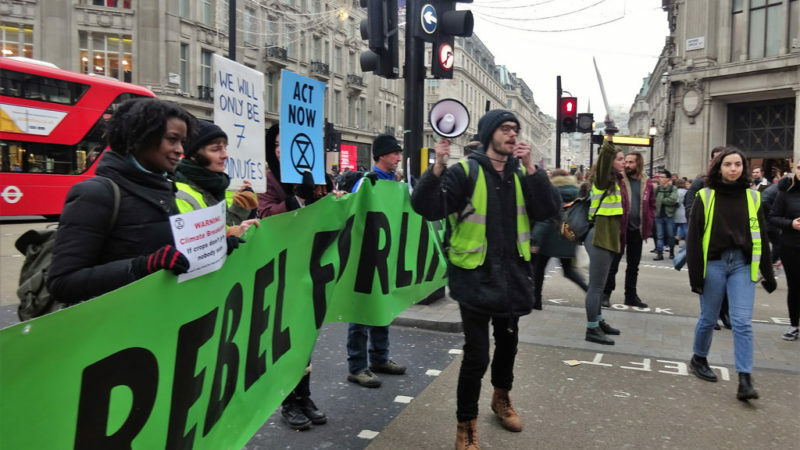 While our government ignores the IPCC report, turning the slow cog of Brexit chaos and getting on with ‘business as usual’, thousands in the UK and around the world are joining our movement for change and pledging to risk losing their freedom in order to save life on earth, volunteering to be arrested during the International Rebellion beginning 15 April 2019. More and more people of all colours, creeds and backgrounds have decided that they’ve simply had enough. Enough of the inaction, enough of the lies, enough of billionaires profiteering from the theft of our futures, the destruction of our natural resources, while the rest of us are expected to simply accept our fates. 1. The government must tell the truth about the climate and wider ecological emergency, reverse inconsistent policies and work alongside the media to communicate with citizens. 3. A national Citizen’s Assembly must be established to oversee the changes, as part of creating a democracy fit for purpose. We will not leave it to our children to deal with the death of the natural world. We will do what we can to stop this madness. We realise that we might fail, but we must try. So, join us at the Spring Uprising festival in Bristol. Skill up to rebel against the criminal inaction of our government. Help us co-create what could be one of the largest non-violent civil disobedience acts in decades. A question will be asked in the future: What did you do when there was a climate emergency? Our children’s futures depend on the decisions we make now, today, not next year or even next week. See you in Bristol 16/17 March and on the streets of London 15 April. This piece is written by the Extinction Rebellion team.